Dhaka, Bangladesh – April 23, 2014 – One year after the horrific Rana Plaza factory collapse that claimed hundreds of lives in the Greater Dhaka Area of Bangladesh, UFCW Canada is traveling to Dhaka to meet with trade unionists, health and safety experts, and survivors of the Rana Plaza tragedy to express solidarity with the building collapse victims and demand better health and safety protections for textile workers everywhere. Following the Rana Plaza tragedy, in which more than 1,100 factory workers were killed and 2,500 others were injured when their workplace building collapsed, UFCW Canada worked closely with international partners and leading retailers like Loblaws and H&M to secure an agreement that seeks to prevent similar tragedies from occurring in the future. Known as the Accord on Fire and Building Safety in Bangladesh, the binding agreement requires some of the world's largest retailers and clothing manufacturers – who together operate more than 1,000 production facilities globally – to implement life-saving health and safety standards and put people before profits at their factories in Bangladesh. But Walmart and other large corporations operating in the country have refused to sign the Accord, and there is still progress to be made among the agreement's signatories in areas such as factory inspection, workers' compensation, and workplace health and safety requirements. To honour the workers who were killed and injured in the Rana Plaza building collapse, UFCW Canada's National President Paul Meinema is traveling to Bangladesh on a fact-finding mission where he will meet with Rana Plaza survivors and see what has changed and what has not changed in the wake of the disaster. Brother Meinema will also be joining with allies to call on companies that have not signed the Accord to protect textile workers' health and safety by signing the agreement, and will be reporting his findings to the Canadian labour movement at the Canadian Labour Congress (CLC) Convention this May. 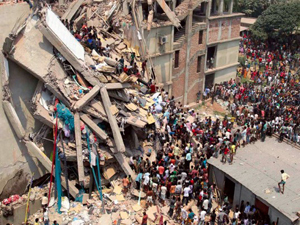 "The Rana Plaza tragedy highlighted garment retailers' complacency in protecting workers' rights and safety in Bangladesh and elsewhere, and UFCW Canada was proud to play a leading role in prompting corporate accountability on this issue," says Meinema. "However, Walmart, YM Inc., and others have yet to take real action to ensure that the events of last April never happen again, and these companies need to sign the Accord to demonstrate that they are serious about protecting garment workers' health and safety" he adds. UFCW Canada is the country's leading voice for retail workers, representing more than a quarter of a million members across Canada.